19th century very unusual large copper and brass serpentine edge pot with hand dovetailed joints. 19th century very large and heavy copper pot with thick twin copper handles, and unusual serpentine edges chased with brass in a fluted design. The lining is tinned, and the pot has hand dovetailed joints. It is an excellent quality piece, both functional as well as decorative. Probably a wine cooler or cistern, it can also be used by the fireplace, as a stunning focal point. Size-24 inches long by 14.75 inches wide by 6.25 inches high. With initials to front, this is a very lovely and useful antique pot with a very unusual shape and size. 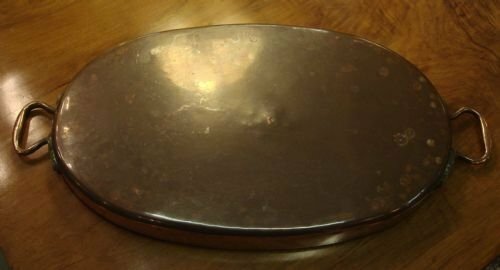 19th century Victorian large copper preserve or jelly pan by Army and Navy Co-Operative Society, in very good condition. 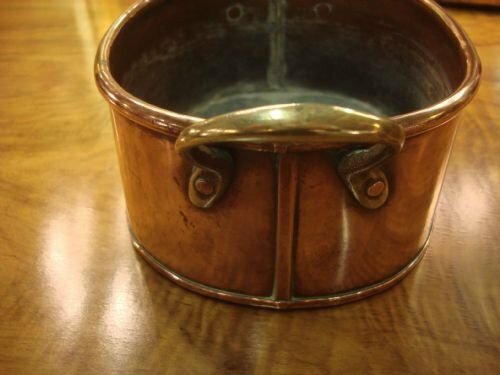 19th century very large and substantial excellent quality Victorian copper preserve or jelly pan with thick twin copper handles attached with copper rivets. This large and heavy thick rolled edge pan is beautifully crafted inside and out, and has a lusterous patina. Marked by Army and Navy Co-Operative Society Ltd. The society was formed in 1871 by a group of Army and Navy officers. It was their intention to "provide articles of domestic consumption and general use to its members at the lowest numerative rates." This would have been a very good quality pan at the time, and remains so today. Size- 17 inches diameter, or 19.25 inches wide including handles. 5 inches high, not including handles. In addition to still being suitable for its original purpose of preserving, it can also be used by the fireplace, as a wine cooler, or to store and display many items. In this climate of being both green and economical, this makes the perfect antique item to use for either preserve making or display. 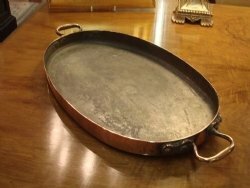 19th century London made unusual large oval twin handled copper baking pan made by Jones Brothers of Down Street, quality makers. 19th century very unusual and large oval twin handled English made hand shaped baking pan with tinned interior, made by Jones Brothers of Down Street in West London. Jones Brothers were well known ironmongers and makers of very good quality cookware from approximately 1832-1900. There is a clear impressed makers mark near the handle. The lovely thick handles are beautifully shaped and double riveted. The pan, formed from a single sheet of copper, has a thick gauge, a lovely colour and patina, and is an unusual type to find surviving. Size-20 inches long (including handles) by 10.25 inches wide by 1.5 inches high. There is evidence of a very old repair to pinhole on bottom. An unusual and lovely pan to use or display, in overall very good condition. 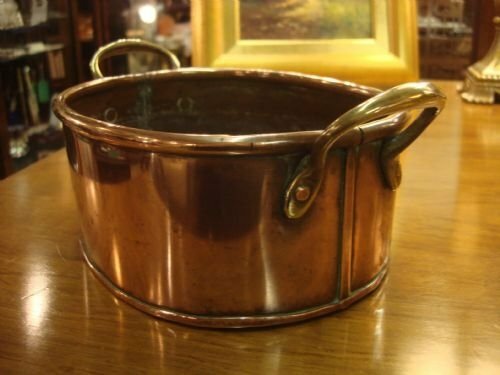 Please see our other antique copper pots and saucepan listings. 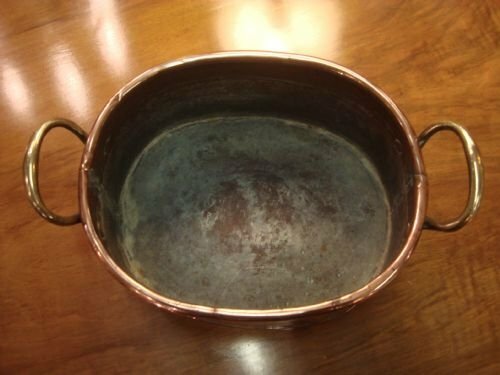 19th century small twin handled copper jelly or preserve pan. 19th century wonderful copper jelly or preserve pan with twin brass handles and tinned interior, in an unusually diminutive size with lockseamed joints. Oval in shape, with turned over edge, and with the brass handles riveted to the pan, this is a lovely pan to use or display in the kitchen. It also makes a gorgeous pot on the table to hold a flower arrangement. Size-10.25 inches long (including handles) by 6.75 inches wide by 3 3/8 inches high. A very useful and decorative piece in an unusual size, with lovely colour and patina to the copper. 19th century very nice large copper saucepan with hand dovetailed joints. 19th century very nice heavy gauged large heavy copper saucepan with hand dovetailed or cramped joints and iron handle traditionally attached with hand hammered copper rivets, making a strong joint. Size- 12 inches diameter saucepan, 24.25 inches with handle. By 4.5 inches high. This particular pan has beautiful dovetailed joints, tin lining, and a long iron handle, as well as a lusterous patina to the copper. A beautiful quality very large saucepan in very good condition, which will look wonderful to use or display. 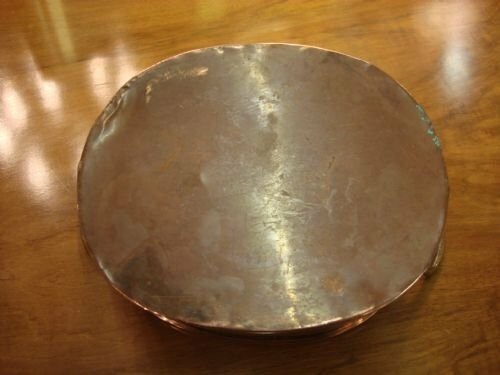 One of several copper pans listed. 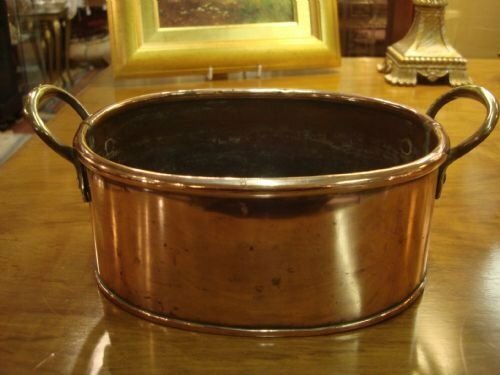 Please see our other antique copper pots and saucepan listings. 1940's set of 6 butter or cheese knives with pearlised composite handles and stainless blades, in the original fitted case. 1940's set of 6 butter or cheese knives with waisted pearlised composite handles and stainless blades, in the original fitted case. A very useful set of knives, with an attractive design, appearing to never have been used. Useful for butter or cheese, and will work with both contemporary and antique table settings. A very practical and stylish set in very good condition. 19th century copper brass and turned wood hot water bedwarmer or warming pan. 19th century unusual copper brass and turned wood bedwarmer or warming pan. This is heated with hot water. 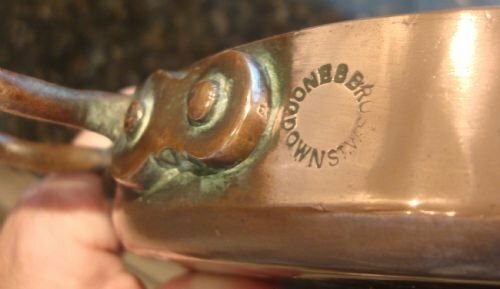 The wood handle unscrews where the brass connects to the copper. This reveals an inner stopper that opens and allows hot water to be poured into the copper receptacle. Size- 41 inches long by 11.5 inches diameter. Lovely as a decorative piece. Good condition with some dents to pan. 19thC attractive copper saucepan with iron handle. 19th century very attractive heavy gauged copper saucepan with long iron handle, attached with copper rivets. Having a lusterous patina, and tin lining, this will make a great pan to use or display. Size-8 5/8 inches diameter, 18 inches with handle. 4.5 inches high. Circa 1920 English Blow brand 6 imperial quart extra large butter churn. Circa 1920 Blow brand 6 imperial quart butter churn in very good all original working condition. Made in England with "Revolutionary" patented football style gear mechanism with the original paint. Size-16 inches high by 7.25 inches square. Working condition with no damage, and a very smooth churning mechanism and nice clean paddle. An interesting piece of kitchenalia, that can still be used, or would make a great display. 19thC attractive antique copper saucepan with iron handle. In very good condition, very slightly out of round.